Here's something we didn't see coming: according to UK retailer Gamestation, SEGA is bringing the queen of all sci-fi series to DS in October. 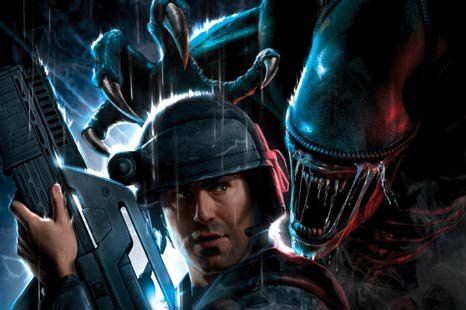 The retailer's website lists Aliens: Infestation for DSi and DS Lite, and further digging revealed the game's presence on an in-store pre-order list with a tentative release date of 7th October 2011. In May, the Australian Classification Board rated Aliens: Infestation by portable masters WayForward. A quick check of our calculators also reveals that 2 + 2 = 4, so expect to see Aliens: Infestation officially revealed by SEGA in the near future. Haven't heard of this game. Sounds interesting. Yeah it was also added to the release forecast of this month's issue. It was speculated this game has long been cancelled. A while back it was leaked on youtube and I think was yanked off soon after. Anyway, looking forward to the Aliens WiiU game. Sweet, my brother's going to love this! Aliens being the Queen of sci-fi movie series makes sense, since Star Wars is the King. I'm not terribly excited I'm afraid. I don't mean to rain on your parade but honestly, I don't see this game getting anything higher than 6/10 or 7/10. I am definitely interested in anything Wayforward does. Though I prefer their original stuff, with their charming anime-esque art, everything they do is pretty high-quality. Even movie tie-ins like Thor. But this lies somewhere in between; sure it's using a movie license, but it's not like it was rushed to make a movie's release date. Not to mention, they actually got MORE time to work on it since Gearbox delayed their Aliens game so much. I wonder if Gearbox's game is scheduled to release this year too? At any rate, I wanna see what Wayforward's been doing with this. Will it be like Metroid? Contra? Something a little more cinematic, hopefully — a touch of Flashback or Another World? The guys at Wayforward know their 2D games. It's going to be exciting to see what they turned to for inspiration when designing Aliens DS. An Alien game made by Wayforward? Knowing them, they might make this into a side scroller shooter.